ESPA at Resorts World Sentosa is one of the most amazing spa facility I have checked out during our travels around the world. 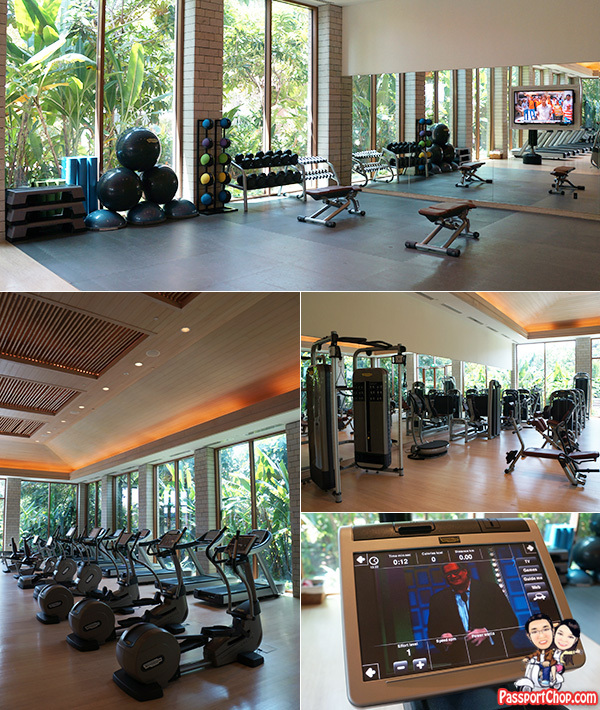 It is definitely one of the biggest in Singapore with over 10,000 square metres comprising luxurious treatment pavilions, private beach villa, garden spa suites, a well-equipped gymnasium as well as the Tangerine restaurant. 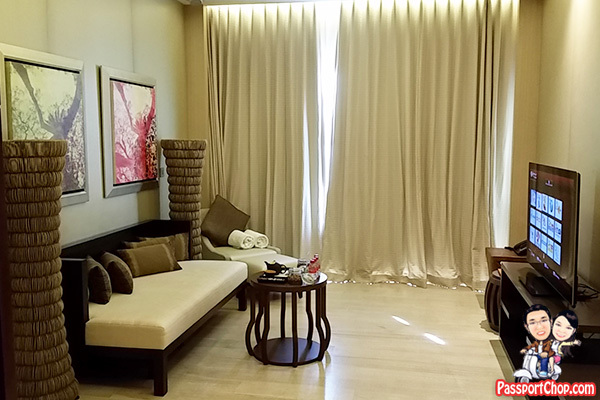 During our staycation at Equarius Hotel, we had the opportunity of being pampered by the luxurious ESPA spa treatments (thus making it more of a spa-cation :-)). 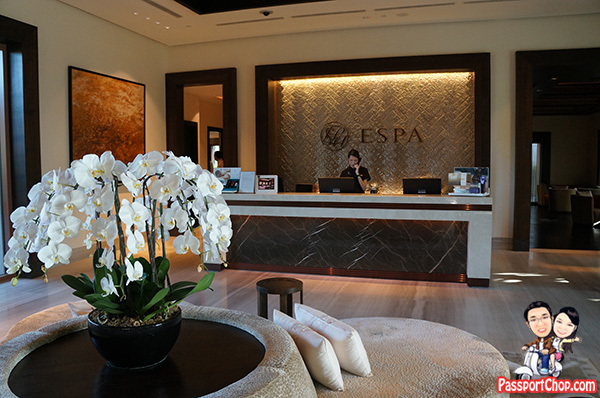 Here at ESPA at Resorts World Sentosa (just across the road from Equarius Hotel), everything from the check-in process and the waiting for your treatment is done in a very smooth and no-rush way i.e. you won’t be rushing from place to place to get your spa treatment. Despite being at full capacity, we were still able to enjoy a lot of privacy when we use the ESPA facilities e.g. saunas – the layout of the ESPA facilities seemed to be designed such that as much as possible, the guests are all spread out across different spa treatment areas. The ESPA staff are always around to help but when their services are not required, they can somehow always stay out of sight – thus offering you lots of privacy and personal space. ESPA at Resorts World Sentosa’s signature facilities include Singapore’s first authentic Turkish Hammam, Vitality Pools, Forest Onsen-style Pools, Rock Saunas, Crystal Steam rooms, and the celebrity spa café Tangerine. With ESPA at Resorts World Sentosa’s Destination Spa programme, you can also work with ESPA to achieve your specific wellness goals from weight management to detox. The best part about doing a spa treatment at ESPA is that with a booking of a minimum 60-minute treatment, all ESPA guests can enjoy complimentary use of all these facilities – Crystal Steam Rooms, Rock Saunas, Ice Fountains, Experience Showers, Outdoor Vitality Pools, Sleep Zone and Social Relaxation Lounge and trust me, you will want to use these cool facilities as they complement your spa treatment to cleanse, revitalise, stimulate or calm (depending on the facility you use) you. Do note that all the above facilities (except for the Forest Onsen Pools and Social Relaxation Lounge) are separate male and female facilities. One thing you should try while waiting for your spa treatment with ESPA is to take a dip in the Forest Onsen Pools – you can soothe your body and senses in these beautiful Japanese-inspired pools which contain mineralized water at a comfortable 40 – 42 degrees Celsius (see picture below – the Forest Onsen Pools are just outside the waiting lounge which in itself is beautifully designed). 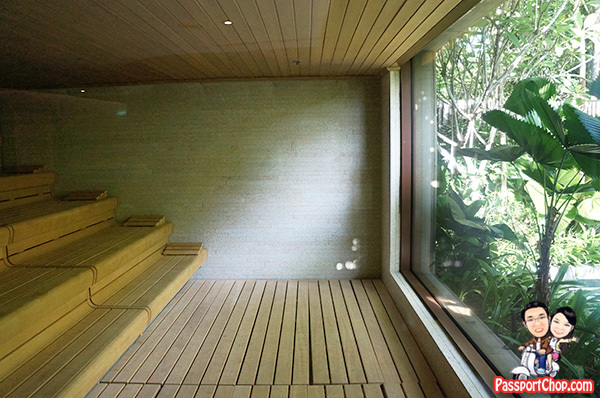 Unlike most saunas which are dingy and dark, ESPA’s Rock Sauna is bright and airy with a glass wall unveiling uninterrupted views over the pools and forest beyond. You don’t even have to do your own adding of water over charcoal like in some more traditional saunas – everything e.g. the temperature and humidity is automatically controlled for maximum comfort. And if you want an alternative sauna experience, just walk a few steps to the opposite ESPA’s Crystal Steam Room – chocolate and gold mosaics shimmer in this exquisite crystal steam rooms, where ESPA’s signature amethyst crystals are placed for balancing and healing. After using your preferred heat experience, take a handful of ice flakes from the Ice Fountain and place them on your pulse area to cool down, refresh and revitalise your body. Alternatively, step inside the Experience Shower to take a tropical rain-like shower or a “hydro massage” with six body jets and an overhead shower for head-to-toe invigoration. ESPA’s Vitality Pool is another must-try during your spa-cation with Resorts World Sentosa. 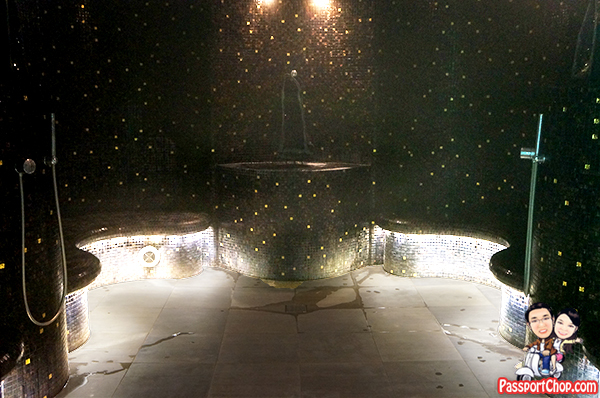 Start off by stepping into the Vitality Pool which is heated to about 36 – 38 degrees Celsius for optimal comfort. Specially designed loungers will allows you to relax in this warm oasis while hydro-jets overhead and within gently yet effectively relieve muscle tension. After 10 to 15 minutes, dip into the Cold Plunge Pool and let the cold water regulate your body temperature and prevent overheating. At the same time, it puts you in an optimally relaxed state to reap the benefits of the treatments that follow. By now, you might be thinking – with so many awesome facilities, where got time?! That’s why you should come early to allow for sufficient time before treatment (there will be some admin processes where you will need to complete a Spa Consultation Form and/or Health Questionnaire). 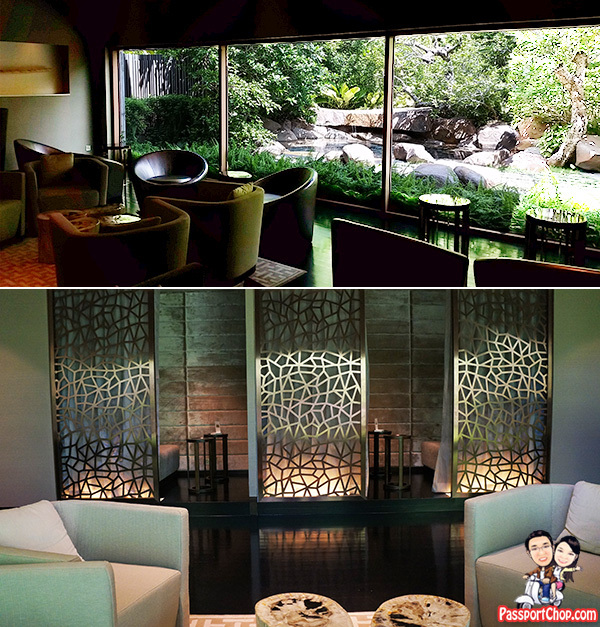 I recommend arriving up to one hour before treatment time to allow time to change, relax and enjoy the spa facilities. 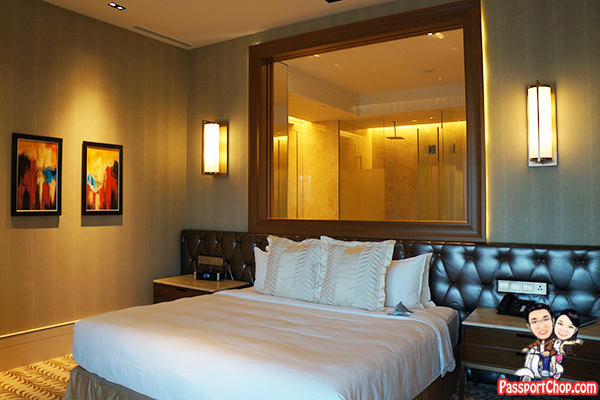 ESPA at Resorts World Sentosa provides towels, robes and slippers, as well as other amenities e.g. disposable underwear required for use during spa visits. If you are going to check out ESPA’s extensive heat experiences and pools, I recommend you bring your own swimwear – although a disposable swimwear is available for ladies, it doesn’t look very comfortable to wear though (haven’t tried it so can’t say for sure but I would imagine that the ladies would prefer to wear their own stylish swimwear for such an luxurious spa experience). 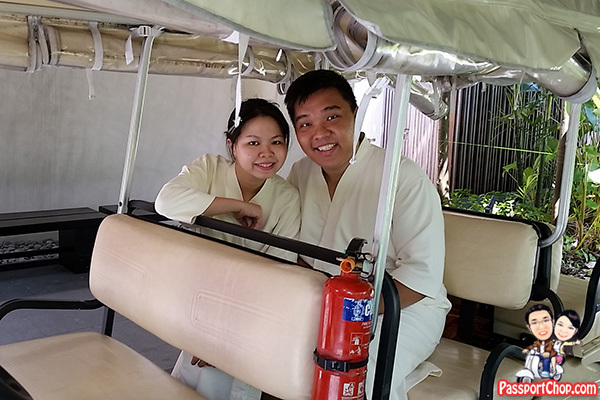 Having changed and experienced the various ESPA facilities, we were then chauffeured by buggy to our ESPA waterside villa treatment suite for our 90-minute ESPA personalised massage (S$280 per person excluding 10% service charge and prevailing government taxes). This is what the view from our spa treatment room looks like – overlooking the Reflections at Keppel Bay buildings and yachts. You can of course choose to close the curtain so you can relax and enjoy the massage and even take a nap (which is what I did – that’s how good the massage experience was!). Created as self-contained, stand-alone spas within the ESPA grounds, the Garden Suites and Waterside Beach Villa Suites feature their own changing room, lounge, relaxation space and outdoor rain shower facility as well as an indoor shower room (which doubles up as a steam room). 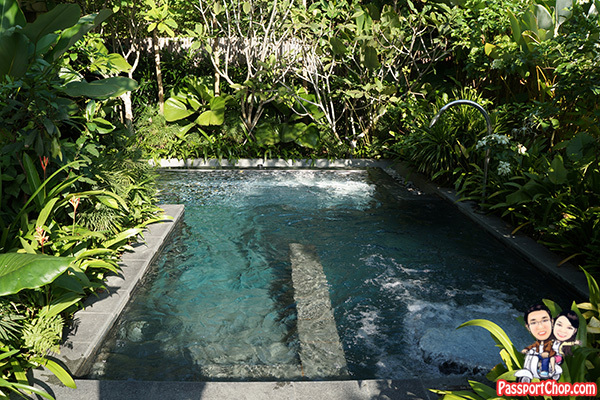 The Garden Suites have two private treatment rooms and the Beach Villa Suites feature a luxury couples treatment room. Both the Garden and Beach Villa Suites can be your haven of tranquility for a minimum of three hours, which includes a 120 minutes treatment of your choice. Rates start from S$450 for 180 minutes. 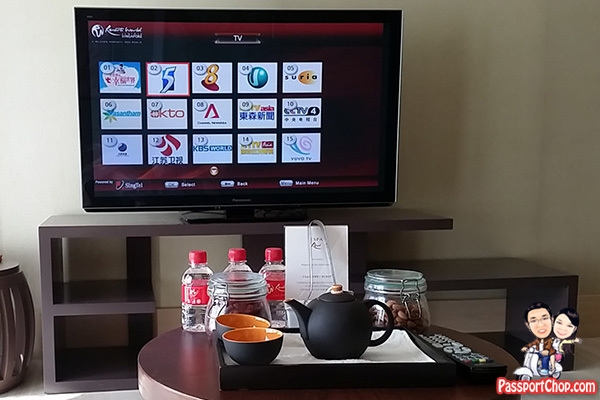 Try the tea and refreshments after your spa treatment – the Cranberry Burst (packed with oxidants to boost immunity and keep skin looking good) and Almond Crunch (rich in Vitamin E, fibre and protein to promote heart health and weight-loss friendly snack) and catch up with local TV or any of the cable TV channels. It is best to completely chill and relax after the comfortable massage session – after all you have the whole villa facilities to use. When you are ready to go back to the main ESPA facilities, just give the reception a call and they will send a buggy to bring you back. 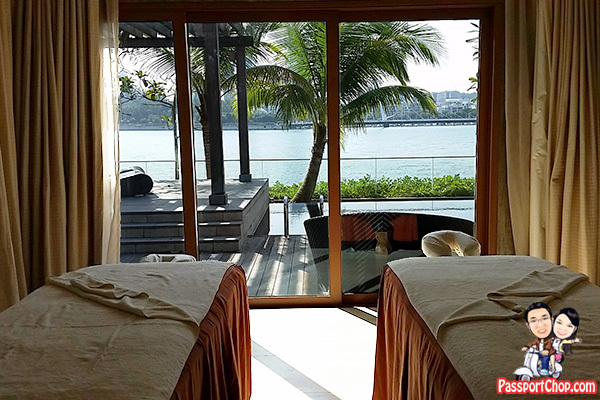 Our waterside villa suites features a large terrace with views of the urban landscape of Singapore and an outdoor massage area where you can enjoy the massage with the gentle sea breeze. The infinity pool within the villa grounds is also great for a dip before or after your spa treatment session. 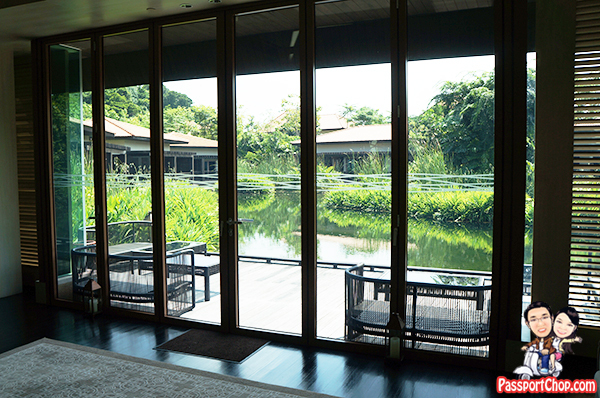 There are comfortable lounge chairs around the villa for you to chillax around while enjoying the afternoon sun. 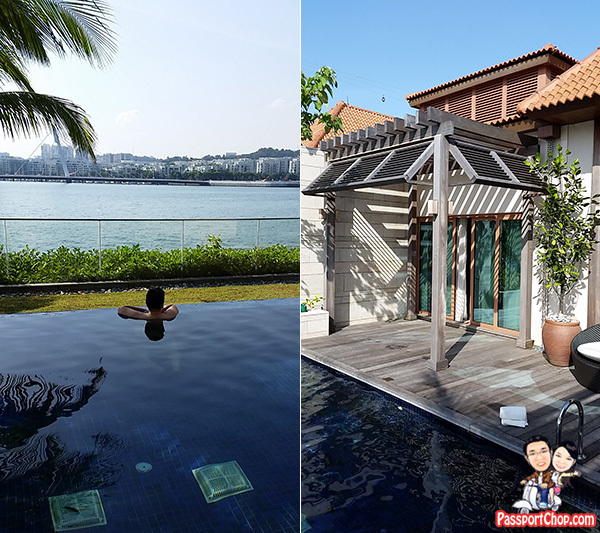 Overall, this is a very great experience – it feels like a staycation (at ESPA waterside spa treatment villa) within a staycation (at Equarius Hotel Resorts World Sentosa) and best of all, total privacy with unbeatable views! Feeling completely relaxed after your treatment? To end off your treatment, you can take a nap at the Sleep Zone where there are 18 purpose-built sleep pods with built-in music and reading lights which are designed to relax your body and allow your body to benefit from the ongoing effects of your treatment. Or/and you can head to the Social Relaxation Room which has sofas and an outdoor deck with loungers where you can soak up the abundant sunshine while enjoying views of the reflection pool. This is also a good spot to catch sunset over Resorts World Sentosa. And finally back to the Equarius Hotel (just across the road – linked by a sheltered walkway; 3 minutes walk away) to complete your staycation experience with Resorts World Sentosa. If you can’t sleep or just need to get your daily exercise fix, you can also check out ESPA’s gymnasium which is equipped with the latest Technogym cardiovascular and strength machines and a free-weights area. There are experienced ESPA trainers available during working hours to assist with sports training, personal goal-setting and the creation of life-changing, personalised fitness programmes (charges apply for some of these services – please check with ESPA gym staff for more info). The ESPA gymnasium is open 24 hours daily. Alight 2 stops later at Imbiah station. With the Merlion on your left, walk to your right, cross a bridge and go down the escalator. Enter the doorway at the foot of the escalator to reach a lobby with a pair of Botero statues. 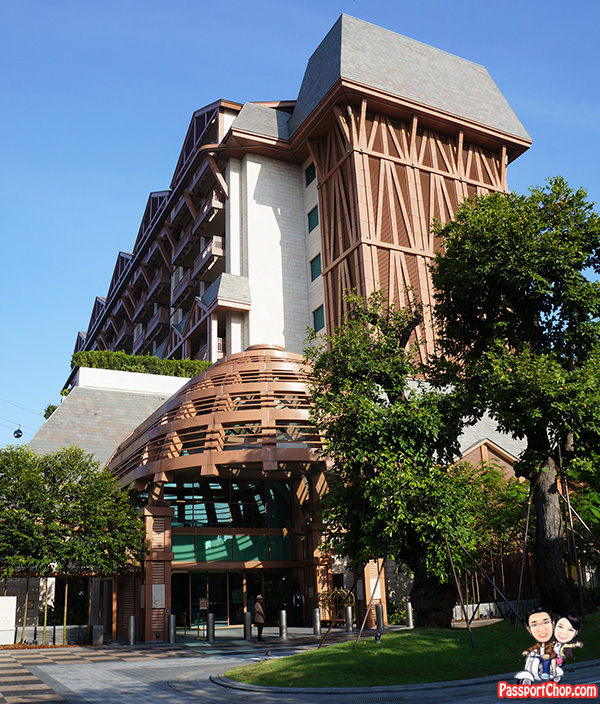 You will find the entrance to Hotel Michael on the left of the lobby. 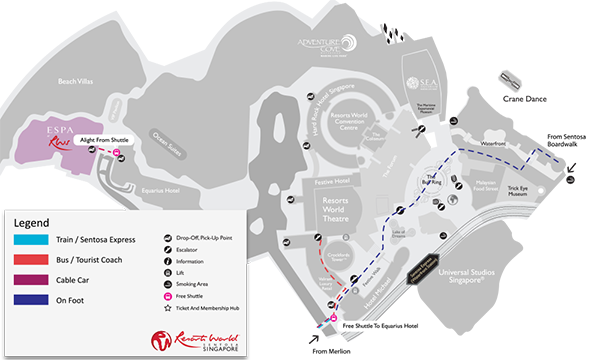 Take a free shuttle to Equarius Hotel from the lobby of Hotel Michael (see picture below for Resorts World Sentosa free shuttle bus route). Upon alighting, instead of entering Equarius Hotel, turn left and walk a short distance to ESPA. Enter via the Forum, walk straight ahead and enter the doorway on the left. Walk through a short corridor and take the escalator up. You will reach a lobby with an elephant statue. Turn left and keep walking past the boutiques in Valiram to reach Hotel Michael. 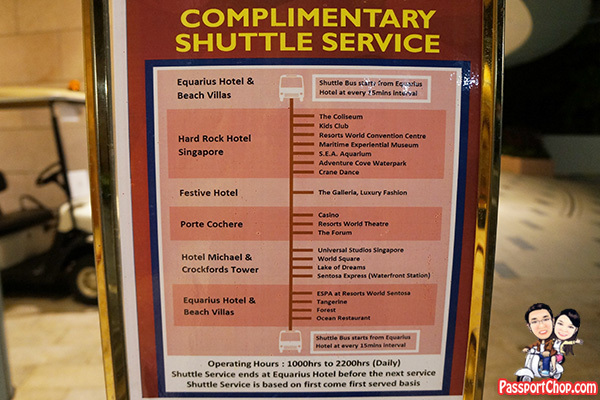 Take a free shuttle to Equarius Hotel from the lobby of Hotel Michael. May I know how much did you spend in total for espa n the staycation at rws? We’re really unhappy with this hotel’s service and misrepresentation about the complimentary car parking. Yesterday was supposed to be a honeymoon night for us, a short staycation to celebrate our wedding. The Equarius stay truly left a bitter taste on our wedding night. If we knew, we would have just stayed at home. We checked into this hotel yesterday and were sent to stay at the remote deluxe room 557 which was super far from the lift. The internet connection in the room was not stable and we could not stream videos, download watsapp wishes from our families/friends congratulating us on the wedding, on our phones (Singtel). This morning, we were glued to the TV watching news of the passing of our founding father, Mr Lee Kwan Yew. The TV reception was bad. The broadcaster’s voice kept breaking which was irritating. The hotel informed us via email there is complimentary car parking. This was also stated in your website. There was no mention that the free car parking is only valid for 1 entry to the car park. We had clarified with the receptionist when we checked in on Sun if carparking was free and he didn’t mention this fact too. So imagine how pissed we were when we went out for supper last night and discovered we will only get refunded for car parking for either the first entry or the subsequent one, after our supper session. I clarified with the receptionist on the parking charges (rates per hour) to see if its more worthwhile to claim the entry before the supper or after the supper. The receptionist simply told us it’s both per hour charges capped at $28. He did NOT inform us that overnight parking is per entry not per hour. We made the wrong decision based on his advice to claim for the car parking fees after the supper which turned out to be cheaper than our earlier car parking fees. We’re super pissed. First, you didn’t give an accurate representation to guests. Then, the staff is not even sympathetic and advised us wrongly. I just hope others will be informed about the carparking charges so that others won’t be cheated. I feel this is misrepresentation! Lousy hotel and service. Ruined my wedding weekend. in depth information you provide. It’s nice to come across a blog every once in a while that isn’t the same old rehashed information. Fantastic read!